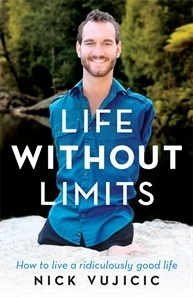 Synopsis- Life Without Limits is the story of gutsy Nick Vujicic, an amazing 28-year-old Aussie born without arms or legs who is now an internationally successful inspirational speaker. Packed full of wisdom, testimonials of his faith and laugh-out-loud humour, Nick tells of life in his ‘Chesty Bond’ body, his visit to Africa at the age of 20 where he gave away $20,000 of his life savings to the poor, and raised another $20,000 for them on the side, and how he learned to surf, skateboard, dive and more. Noting that ‘perfection isn’t always perfect’ and that ‘brokenness can be a good thing’, Nick shows how he learned to accept what he could not control and focus instead on what he could. He encourages everyone to find their life’s purpose and, whatever their obstacles, go for it. He’s already appeared in an acclaimed short film doing his own stunts, and his zest for life is unbelievably infectious. I’d seen Nick on various chat shows earlier in the year while he promoted his book and I remember thinking, what a remarkable man. So inspiring, witty and charismatic. I said to my partner, I would really like to read his book. Sure enough, a new edition of Life Without Limits was published in August 2012 and I jumped at the opportunity to read and review Nick’s autobiography. Nick’s entry into the world was a difficult one, his condition a shock to his midwife mother and her husband. Nick provides a brief glimpse into those first moments when his parents discovered their little boy had no arms or legs. The disbelief, the grief and the guilt. But his family held strong religious beliefs and instilled in Nick their belief that he had a purpose in life. From a tough beginning, to episodes of depression and suicidal thoughts and dealing with bullies, Nick overcomes his limitations, living his life without limits. Religion and faith is a strong theme throughout the book, one that has given Nick strength in his moments of darkness and has validated his being in times of happiness. Nick’s positive attitude bounces off the pages and it is clear how many people he has touched and inspired in his life. From learning to swim and surf, to motivational speaking to practical jokes- his anecdotes were highly engaging. I laughed out loud when Nick told of the time he posed as a mannequin in a shopfront window and when he hid in the overhead luggage compartment of a plane. These snippets of his life I could really connect with and found interesting. Life Without Limits reads more like a self-help book than an autobiography. So, I found it difficult to rate this book because Nick is a very likeable, generous and passionate person and I enjoyed reading about his life. However, throughout the book there are also messages from Nick about how to live life to the fullest and to believe inyourself. I suppose these aspects of the book didn’t really appeal to me, but I imagine does connect with people who are looking for that kind of thing. About the author: A motivational speaker and the director of Life Without Limbs (www.lifewithoutlimbs.org), Nick Vujicic has become a great inspiration to people around the world, regularly traveling and speaking to huge crowds across the planet from the United States to Korea. He is also a much sought-after business speaker: http://www.attitudeisaltitude.com. He starred in the award-winning short film The Butterfly Circus.